You’ve probably heard of ESPN, if only during the sports sections of Microsoft’s E3 conferences. They’re pretty damn big in the States, and they cover serious sports like football, basketball, and Dota 2. 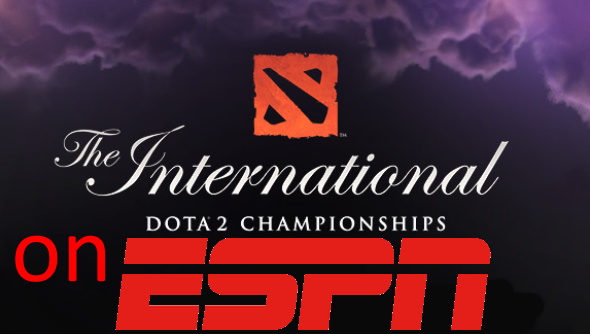 Yes, this year ESPN expands its boundaries to eSports with coverage of The International 2014 through its online ESPN3 channel. Not only that, but a preview of the tournament final will be broadcast on ESPN2, a cable network accessable by 97,717,000 US homes. Looks like Dota 2 is invading the America living room. Matches, interviews, and post-game analysis will all be available between 18th and 22nd July on ESPN3, a streaming service available online via PC or most of those techno gadgets you own. It sounds like they’re going all out with the coverage rather than just token coverage sans experts. The ESPN2 show is just a preview, but some mainstream spotlight on Dota 2 shows how far eSports have come. The show will be broadcast at 8.30pm Pacific on Sunday 20th and will feature previous game highlights as well as interviews with players and Gabe Newell himself. The International is always big news in the eSports scene, but this year is particularly notable thanks to its overspilling $10million prize fund; the biggest ever for an eSports competition.